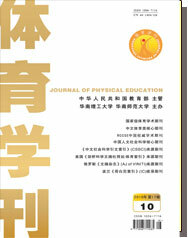 Abstract: The author conducted a comprehensive investigation on the competitive sports development of the American Parker 12 league, dissected the fundamental reasons for the long lasting development of American uni-versity competitive sports from the culture perspective, thus contemplated realistic paths for the future development of Chinese university competitive sports. The author drew the following conclusions: The long standing American campus sports culture tradition is the solid foundation for the long lasting of university competitive sports; mature sports industrial culture is the intrinsic impetus for the sustainable development of university competitive sports; unique local sports culture is the important assurance for university competitive sports development. China should refer to the cultural confidence of American university competitive sports development, strengthen the in-depth fu-sion of university education and sports, expedite university campus sports culture construction, expand university competitive sports financing channels, boost university competitive sports marketized operation, and relying on high performance university sports teams to select and cultivate competitive sports reserve talents.